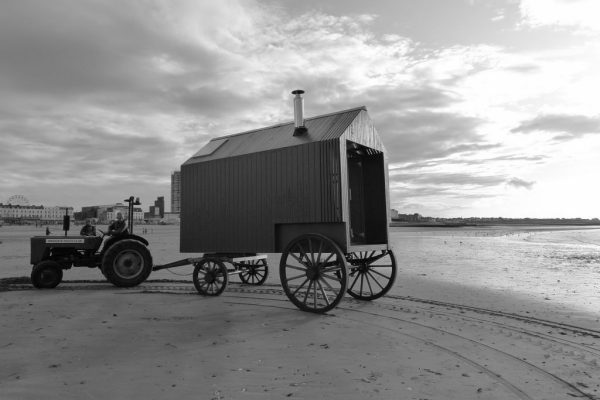 Sea bathing machines, seawater baths and bathing platforms were key in the development of the area, from the establishment of the Clifton Baths in 1828, to the Pettmans beach huts and bathing platforms of the twentieth century. HOD projects reflect the local historical precedent and reinterprets these heritage coastal industries. The exhibition will also present the construction of the Haeckels Sea Bathing Sauna, alongside the designs for a Beach HQ at Walpole Bay. This is proposed as the first new public building on this site since the 1970s, and follows in a tradition of structures at Walpole Bay for the promotion of health and wellbeing. The show will bring local heritage, architecture and design, wellbeing, and the coastal experience together. There will be interactive gallery activities over the weekend and visitors may also experience the sauna in action at Wheels and Fins Festival in Joss Bay. The exhibition is funded by the Dalby Square Townscape Heritage Initiative in partnership with Reworks Studio and Resort.